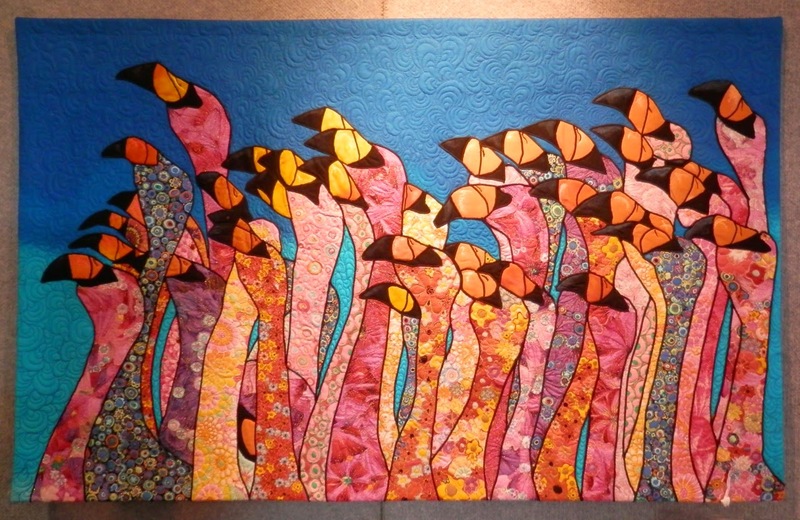 Trisha Downie is the President of Auckland Quilters Guild. 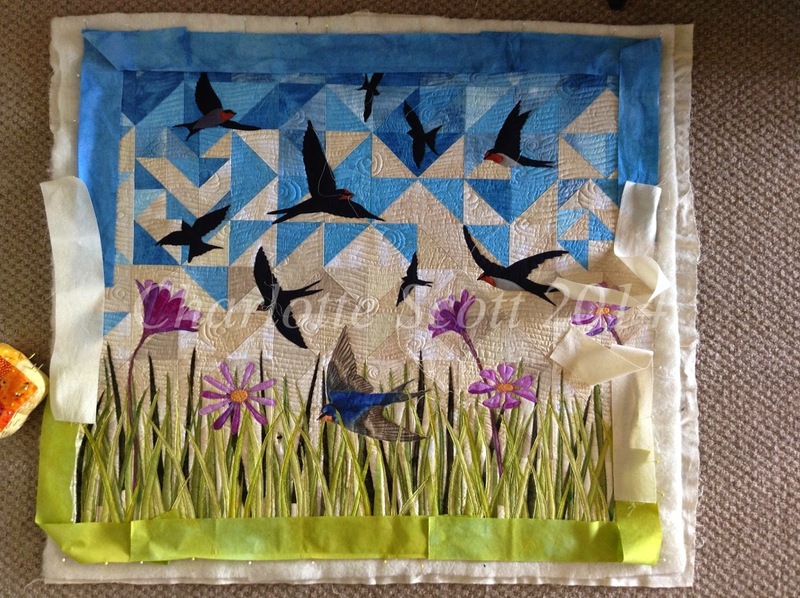 Trisha leans heavily towards mixed media and three dimensional quilting. 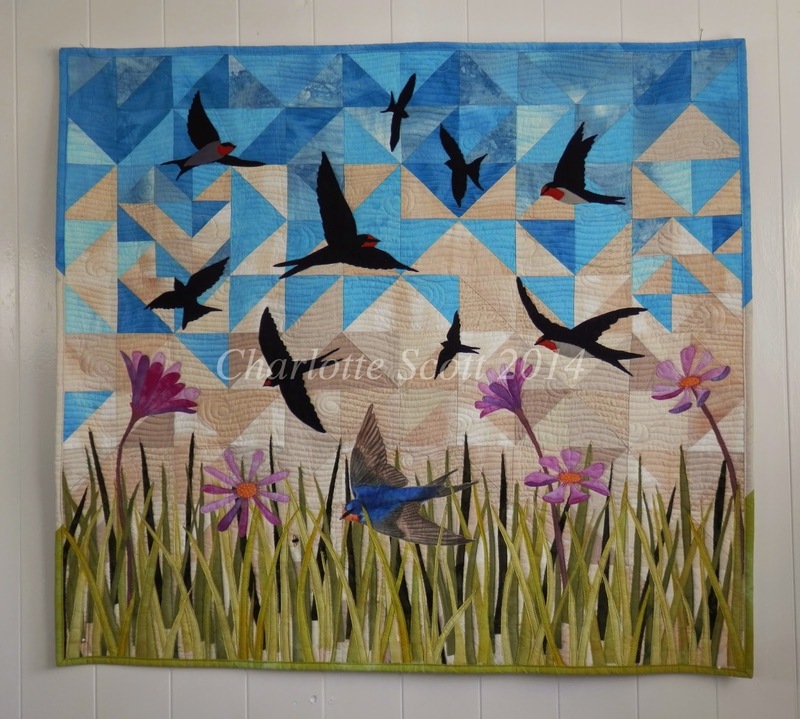 She is hugely supportive of new quilters and quilters wanting to move in different directions and I was excited to interview her about all things quilty. I hope you enjoy our discussion. Thanks Trisha! 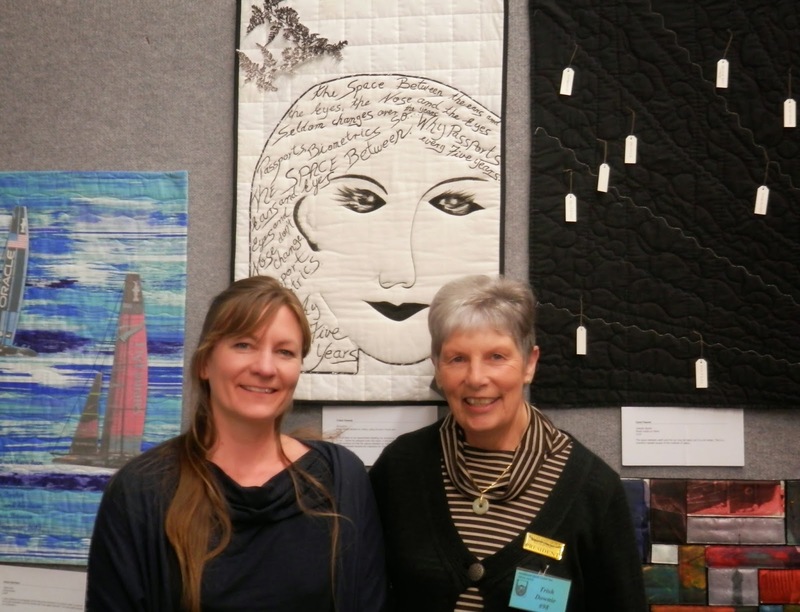 Trisha and myself at Festival of Quilts in front of Trisha's entry in the most recent Dorothy Collard Challenge. 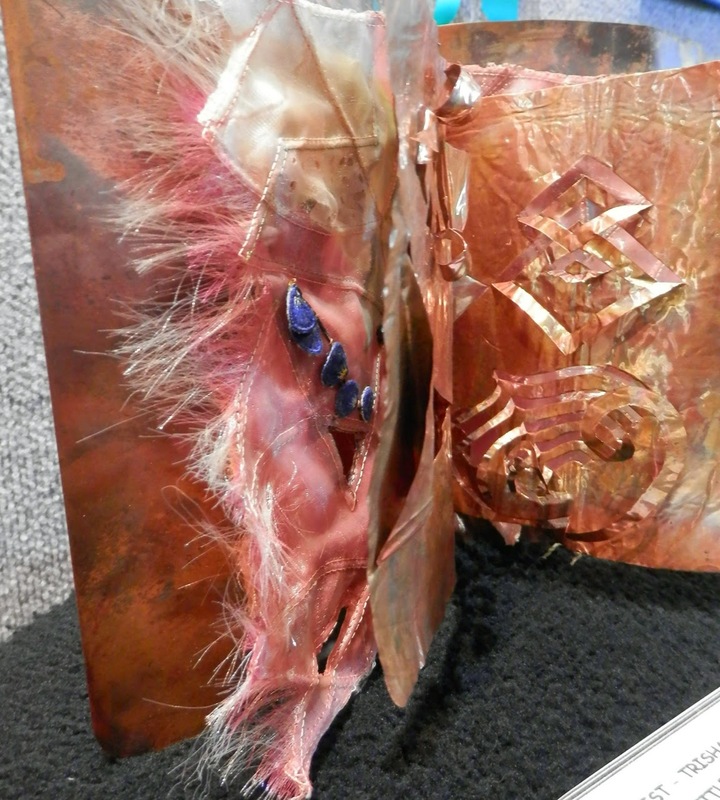 Trisha's entry in the mixed media section of Festival of Quilts, titled 'Copperplate'. Peel rind, no pith, of two lemons, add 2 cups of sugar in to food processor. Process until the sugar is yellow and oily. Tip this into a large saucepan adding the juice of the 6 lemons, minus any pips. Add remaining sugar, the citric acid and water. Over medium heat stir until the sugar has dis- solved. Cool, bottle, and store in the fridge. To drink use 1 part concen- trate to 4 parts water. Alexis Robin is a life-coach who puts out a 15 minute radio show that you can subscribe to in podcast form. She's not overbearing or airy-fairy and I've really enjoyed listening to her. 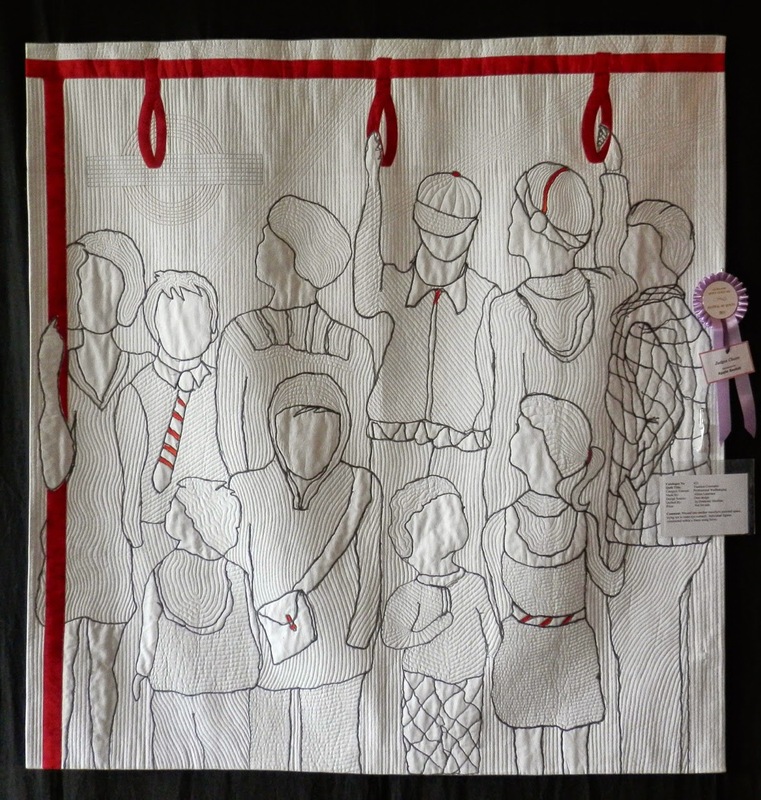 Best Interpretation of Theme Mary Metcalf – For Moi? What a Surprise! 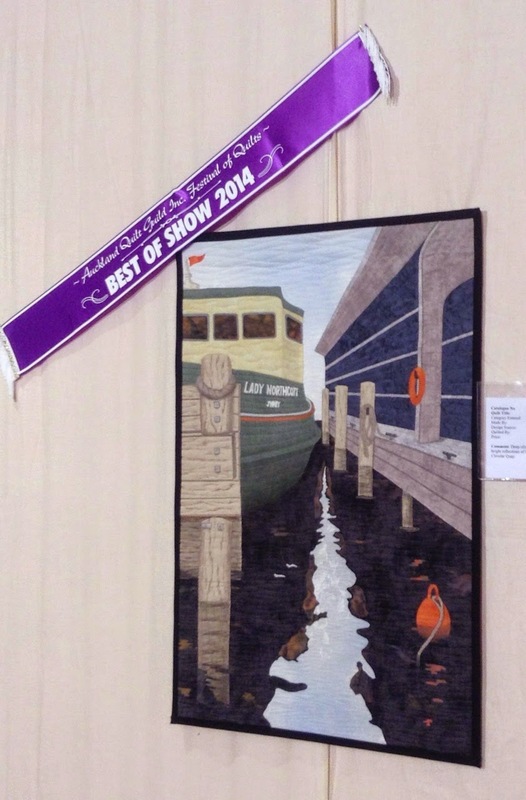 This is a link to the gallery of the 2013 winners. Hopefully the 2014 gallery will be available shortly. 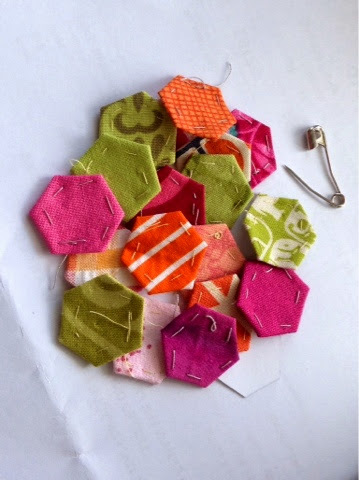 Incy, weency, teeny, weeny hexagons. Cute, huh? I'm pretending that the fiddliness is good for my dexterity. Luckily I don't have to make too many. And it's a secret project so I can't show you much more than that. Tease, I know! It's come to my attention that I've been remiss in not posting one of my quilts that I finished earlier this year (thanks Carol!). It got lost amongst life I guess. 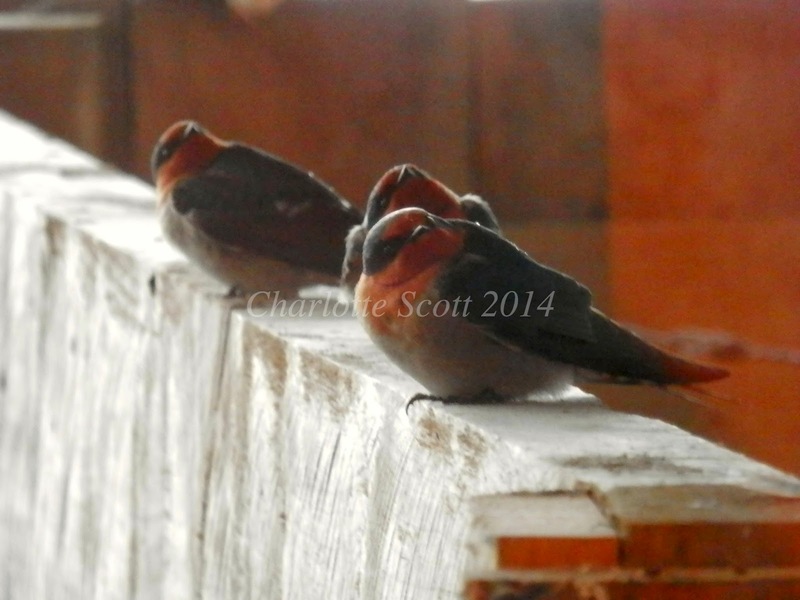 I love Welcome Swallows. They are a small bird with a forked tail. They make mud nests around human habitation and seem curious and lively. I love the colour palette of their plumage too - indigo blue, grey, and burnt sienna. 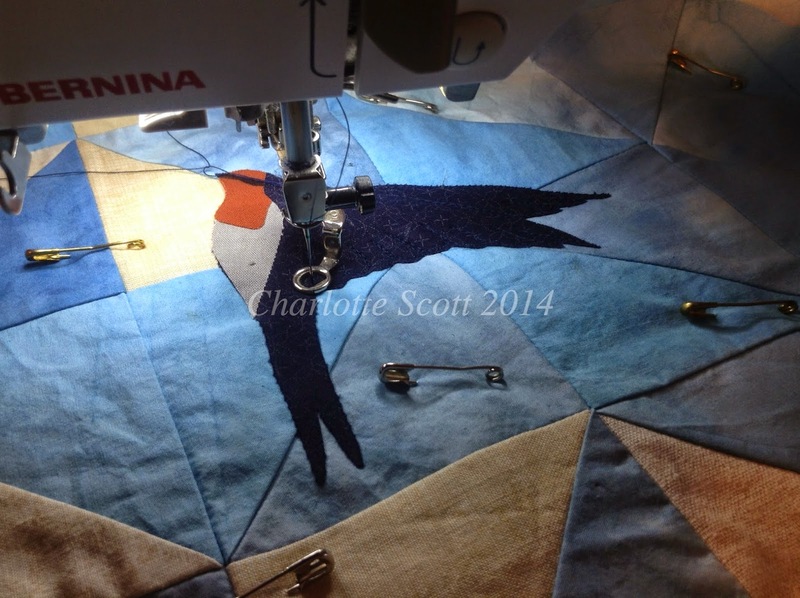 I thought I might make a quilt using their colours and silhouettes of Swallows. Here's how it started on my design wall. 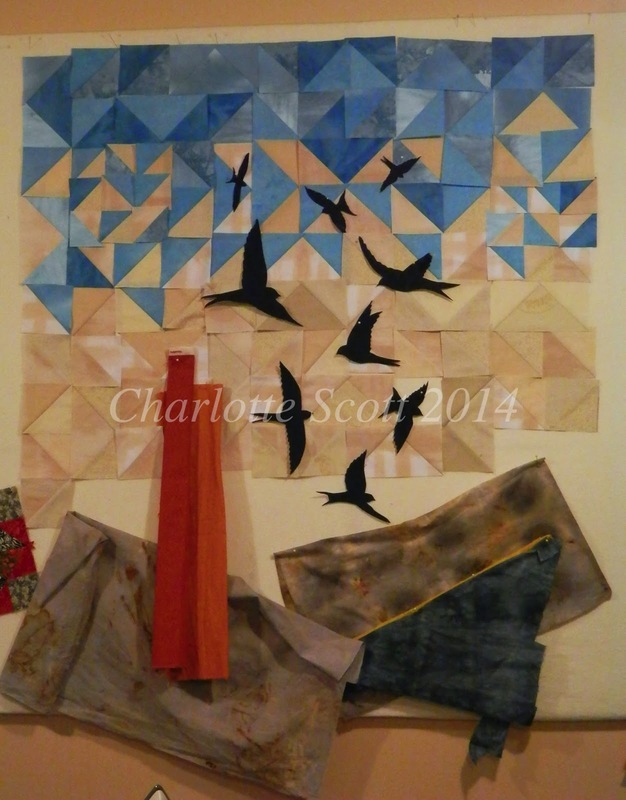 I pieced a background using flying geese and half-square triangles and then began auditioning for hills as a foreground. Eventually it morphed into this - dark indigo silhouettes of the Swallows, indigo and grey hills with touches of burnt sienna and mustard and burnt sienna barn. I used discharge paste to create a line of trees that receded into the distance and this is about where I stalled. I put it away for ages. Eventually (and in a Spring kind of mood) I pulled it out, removed the hills, unpicked some of the sky to make it square and added grass and flowers to the foreground instead. 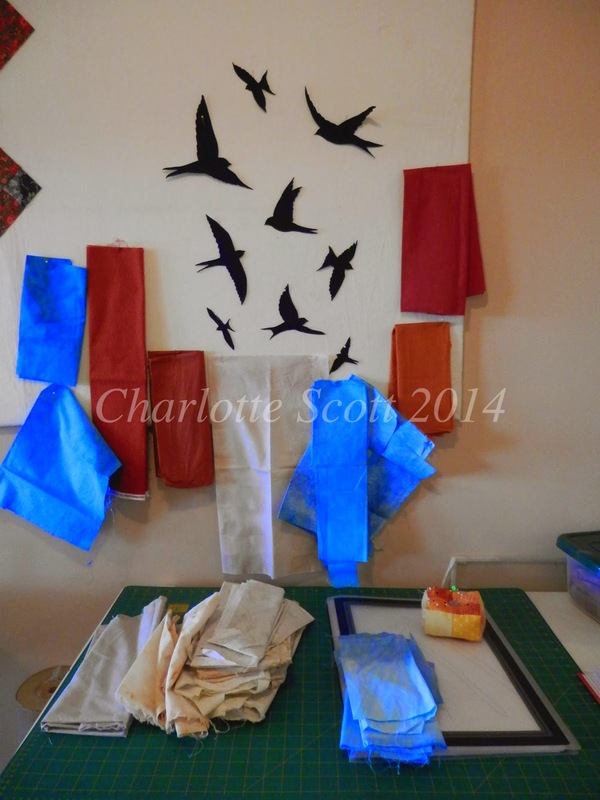 I added some colour to the bird silhouettes and added one larger fully coloured one in the foreground. I free-motion quilted and appliquéd at the same time as I like to do and then free-motion quilted a flowing pattern in the sky using my domestic Bernina Aurora 400 QE. I changed thread colours from mid-blue at the top of the sky, light blue in the middle and cream near the grasses. 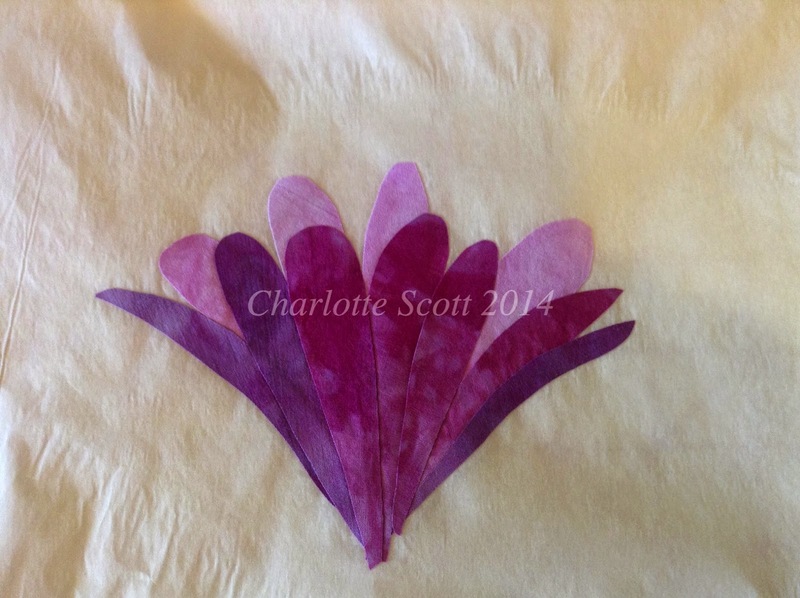 The grasses and flowers were free-motions appliquéd and quilted with matching thread colours. I decided to bind it in similar colours to those in the quilt to have a border, but one that worked with the quilt. You can see my scientific way of measuring those chunks of colour in the picture above. And here's the finished quilt. Once again my colours have been extra-saturated (I'm beginning to think it's the watermark program I'm using - time for an experiment I think). 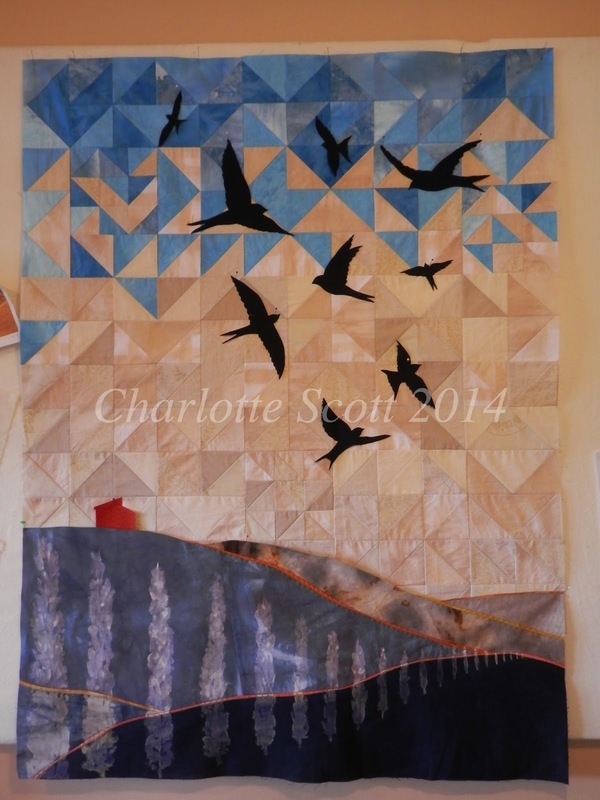 Detail of the sky quilting. 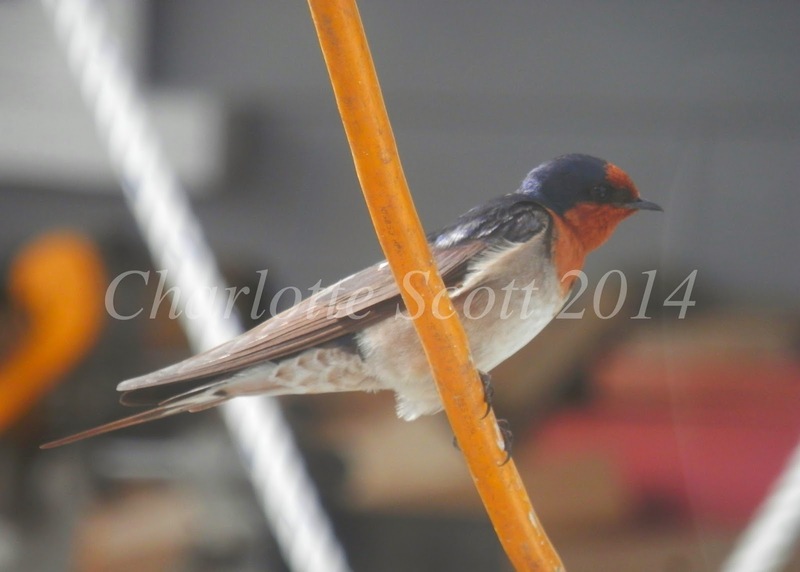 Detail of the foreground Swallow. He was done with coloured pencil and fabric medium on white fabric then cut out and appliquéd/quilted on. And the pretty flowers, done in my hand-dyed fabrics. 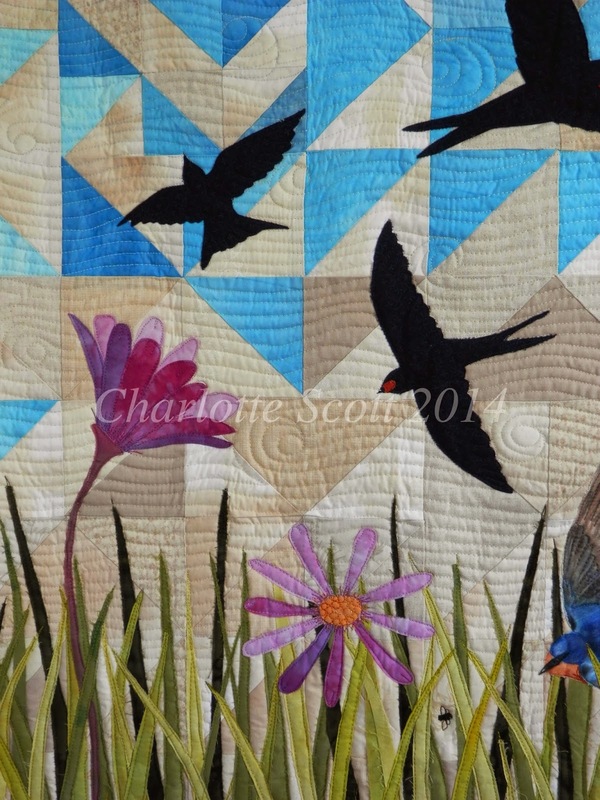 I think the whole quilt has a completely different feel to it now - Spring rather than Autumn. But I'm still interested in re-visiting my previous colour scheme. However I won't be using those hills, I cut a few strips from them and used then in my Cerego 12 x 12 Purple Challenge quilt, the little pops of orange came from here! And because I had to dig it out to photograph it, now I have this quilt hanging next to my sewing machine here on the boat. Both Hubby and I love it, so I think it will stay for a while. I could kick myself! I was in such a hurry this morning to get my 12 x 12 Purple Colour Challenge entries into the mail (they have to arrive by Friday, I think I'll make it) that I didn't take a photo of my heron one. I called it Dawn Ghost and now we are all going to have to wait until January, when I will see the exhibition that it will be hanging in. I'll take a photo to share then. I'm also doing some article writing, which is a new thing for me, but I'm enjoying it. It's a bit more intense than blog writing (break out the grammar police! ), but I think I'll get into a rhythm soon. And I'm being watched over by these little guys. 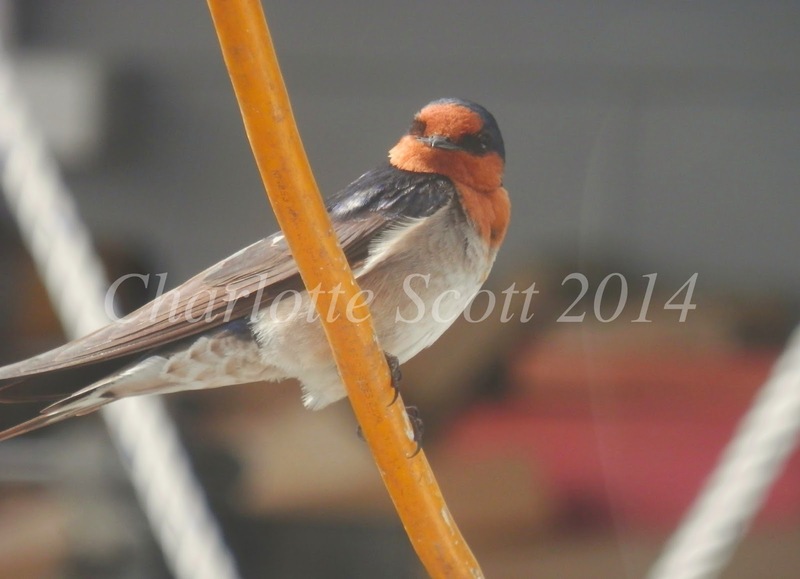 They had a nest this spring under the dock where we are moored. I could never see it, just hear them, and see Mum and Dad flying in and out. The noise has ceased so I'm presuming they've all fledged, but I still see them around, zipping fast and free. Beautiful. 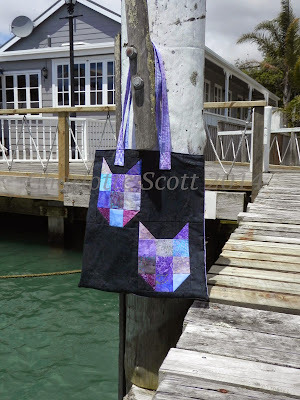 Judi Schon is a quilter from Auckland. 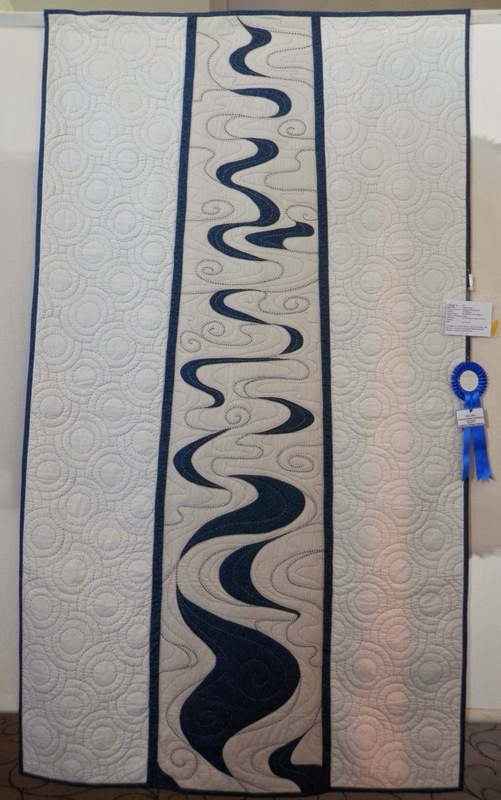 Judi is an award winning long-arm quilter, and runs a small business, Quiltsmith, quilting other people's quilts. 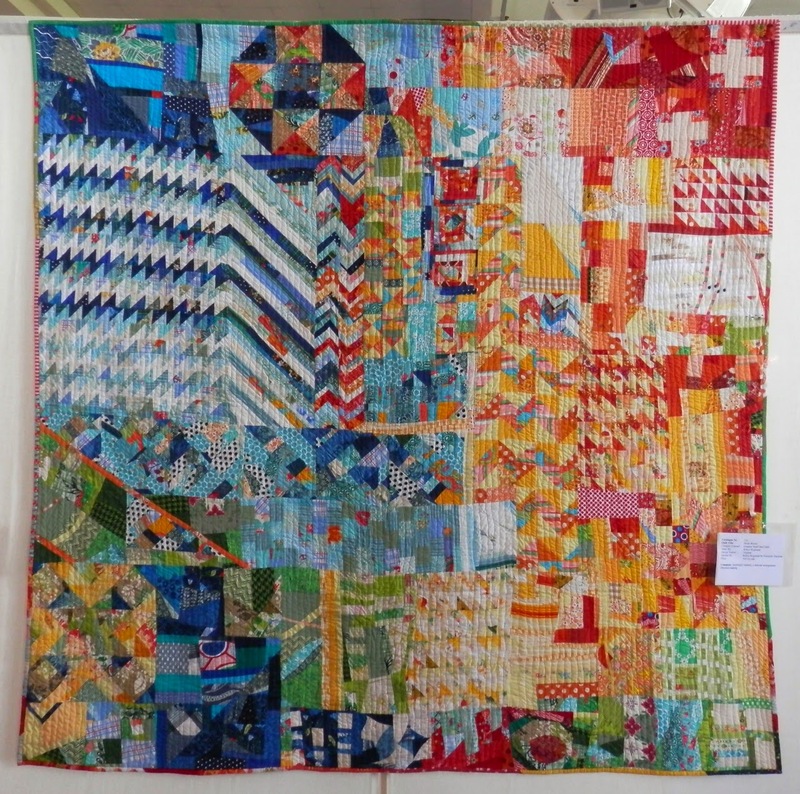 Judi is also this year's Convener for the Festival of Quilts, a big job, and I was interested in finding out more about how you go about organising a big quilting event like this. Judi generously agreed to be interviewed and now I can share this interview with you. Thanks Judi! 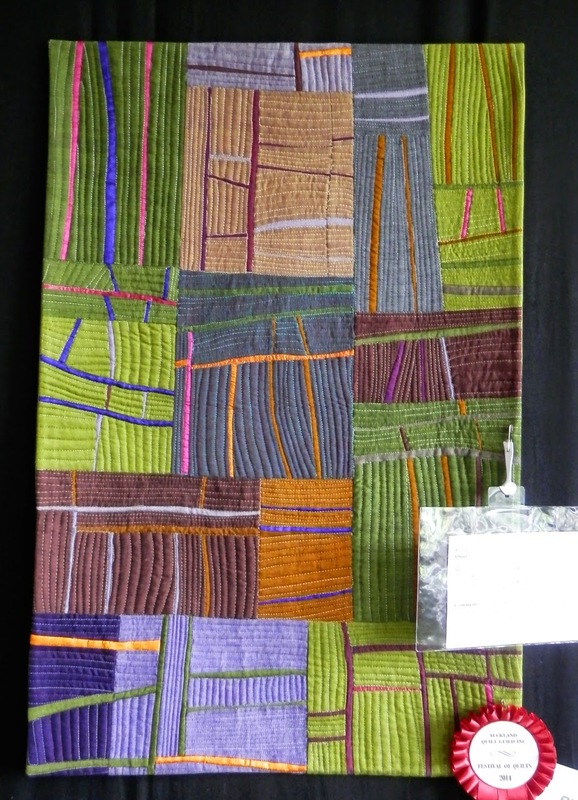 This is Judi's quilt, which we discuss in the interview. 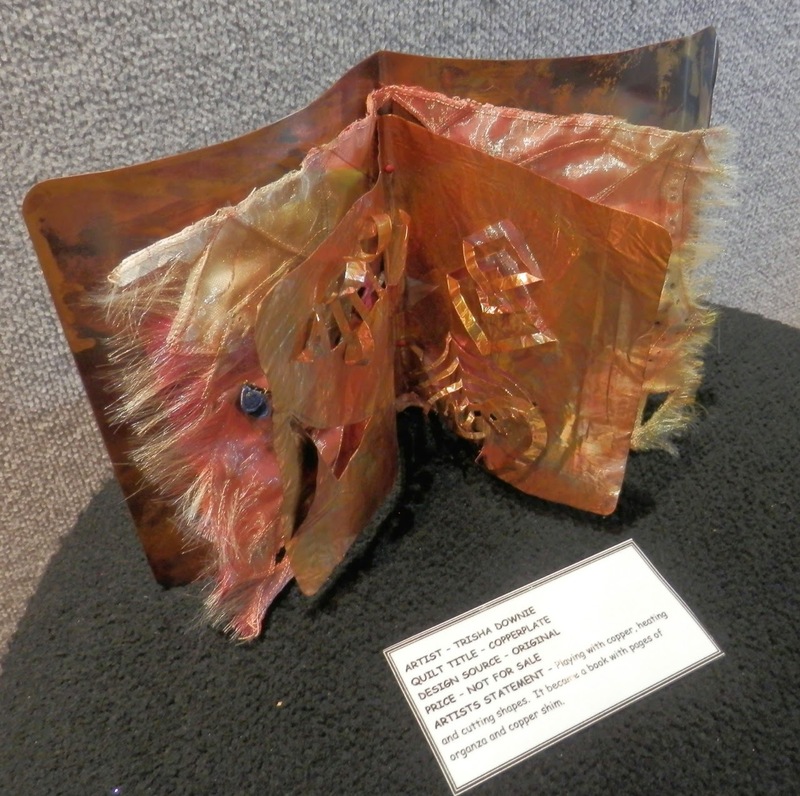 It's called Inside Out, and is made from a design by Kati Spencer that was in the MQU Mag, Fall 2012. It's a howling gale here today, perfect weather for staying inside and putting some stitches in cloth. How's your weekend treating you? I hope you have a great one, wherever you are and whatever you're doing. I've had a productive week. I don't know how it worked out like that, but I'm guessing having deadlines helps just a bit! I've finished writing my midwifery standards review, completed a technical editing project and made a cat tote for a budding crazy cat lady. My inspiration for this tote came from Pam at Hip to be a Square. She said it was okay if I was a 'copycat'. Sorry....couldn't resist. I made if for my daughter's best friend. 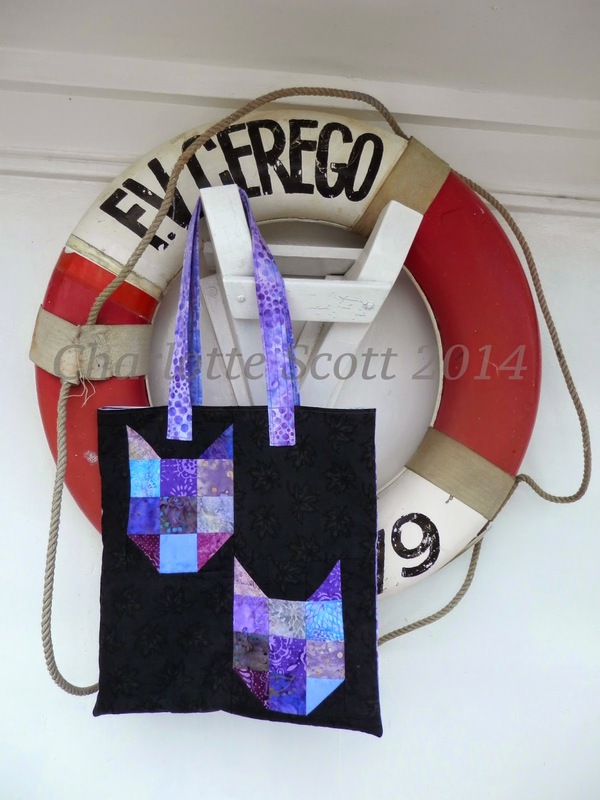 The order was for a bag with cats on it, and her favourite colour is purple. Done and done. Shhhh, don't tell my daughter, but I'm making her one too so they can be all matchy matchy. Didn't you do that with your best friend when you were seven? Love me a stripey lining. Just about as much as a stripey binding. And what do we have here? My very first magazine published pattern. And I made cover girl! Woot! Now that they've published the photos, it'll come home, maybe in time for Christmas? 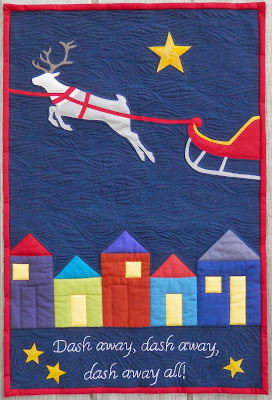 It's called 'Twas the Night Before Christmas and is a cute little wall hanging inspired by my favourite seasonal poem by Clement Clarke Moore. The wallhanging has piecing, fusible appliqué and a little bit of stitchery. 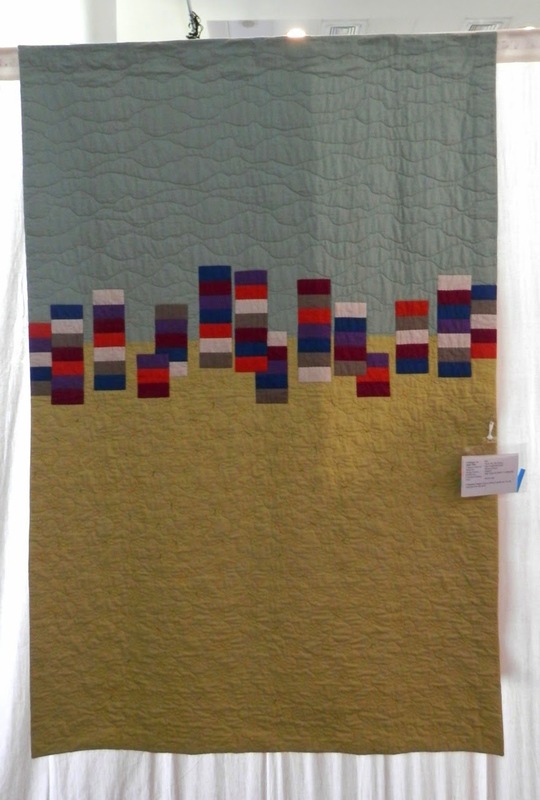 If you are interested in making one of your own (I could imagine it with a snowy white background and red and green houses), you can get a digital copy of Down Under Quilts from here. Gave a luster of mid-day to objects below. With a sleigh full of toys and St. Nicholas too. "Merry Christmas to all and to all a goodnight"
I thought I'd show a few pictures of some of the quilts that particularly caught my eye at the 2014 Auckland Festival of Quilts. Of course the lighting makes it difficult to get great shots, but I hope you enjoy them anyway. And I urge you to go to FOQ next year, up close and personal is the best way to view! 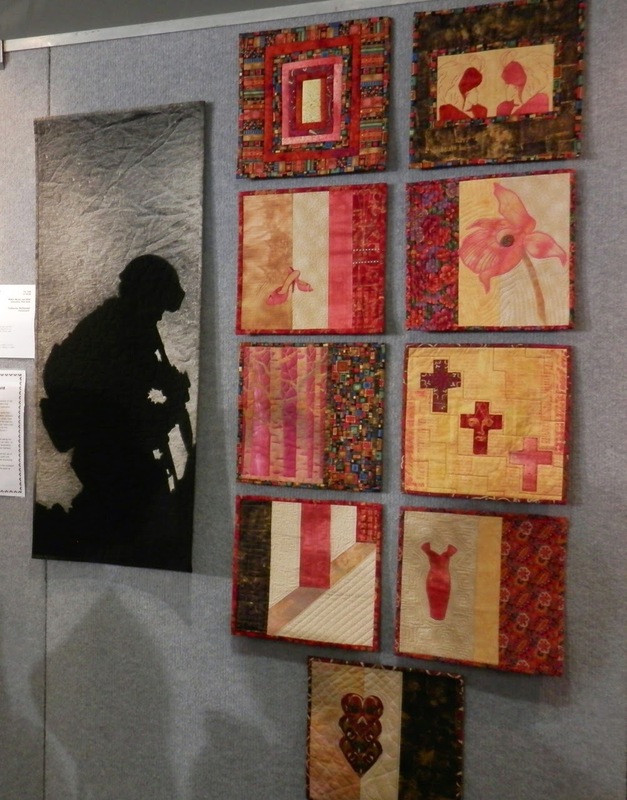 Friday 7th November was the opening day of the 2014 Auckland Festival of Quilts. I have inside knowledge that festival goers were queueing up at the gate at least 20 minutes before opening time! Best in Show. Dockside Reflections by Alison Laurence. I had a great time, travelling down with two of my quilt 'besties', browsing merchants, admiring quilts and catching up with quilt buddies from around the country. 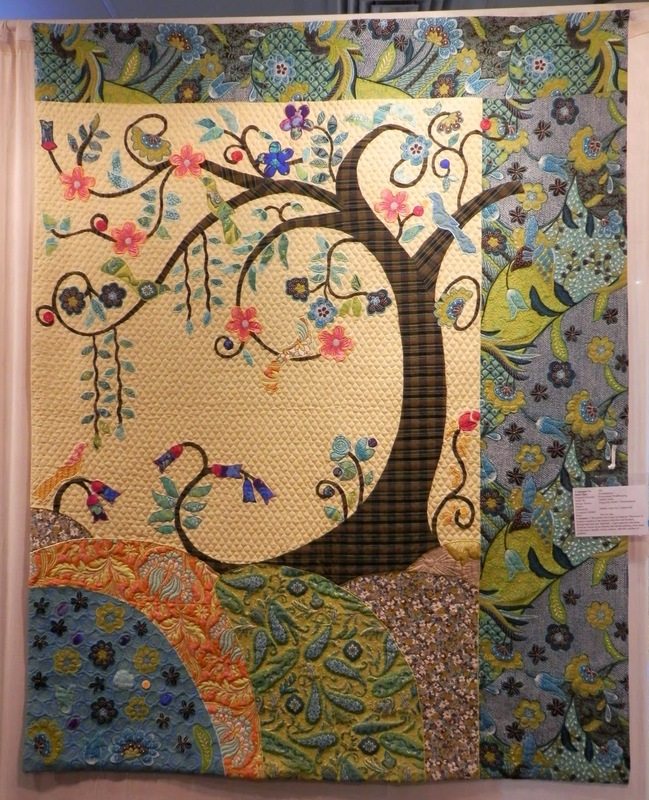 I also had the privilege of interviewing three wonderful women who make quilting a big part of their lives. My first interview was with Catherine McDonald. Catherine was one of the three judges for the Festival. Catherine is the president of Aotearoa Quilters, our National Association, and works hard to promote and support New Zealand quilting. 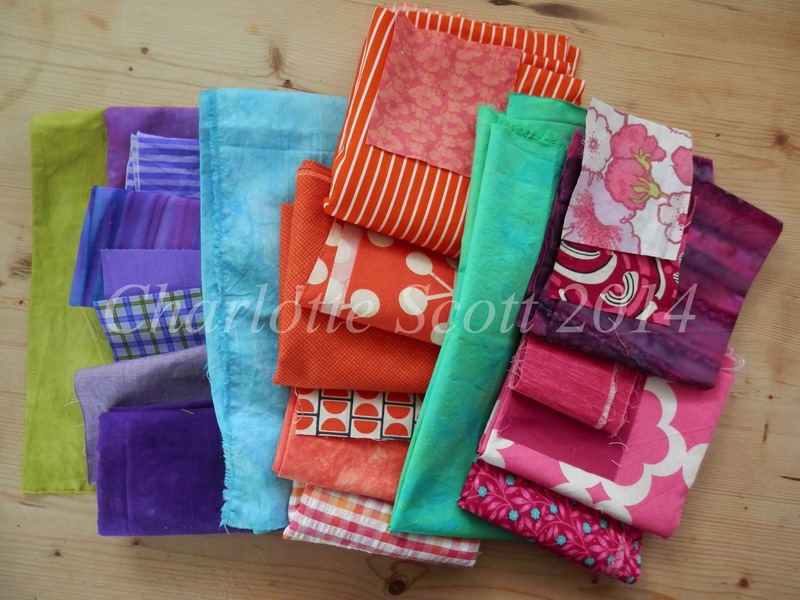 She is also part of the Distressed Threads trio, a small company producing and selling handmade fabric. 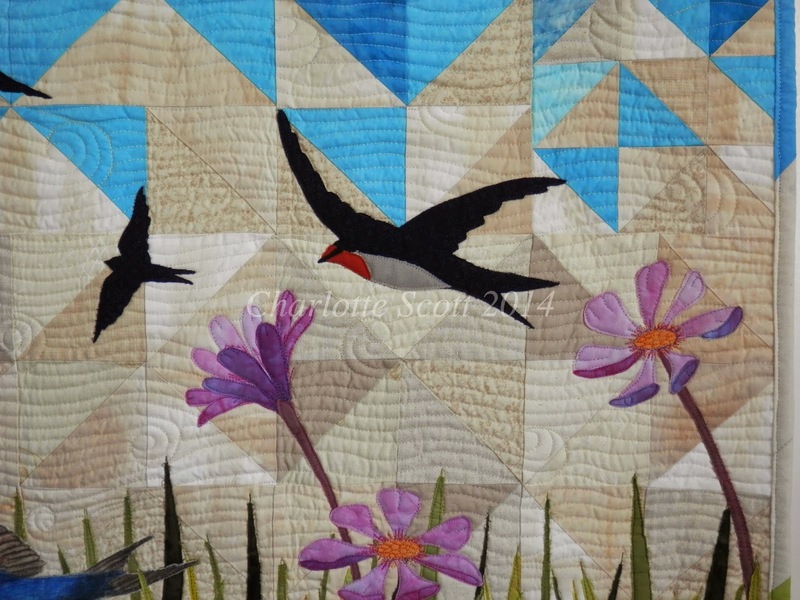 "Quilting gives to me a fellowship, creativity and a connection to the feminine world. Having grown up only with older brothers and having two wonderful sons, my quilts tend to be more masculine than pretty. 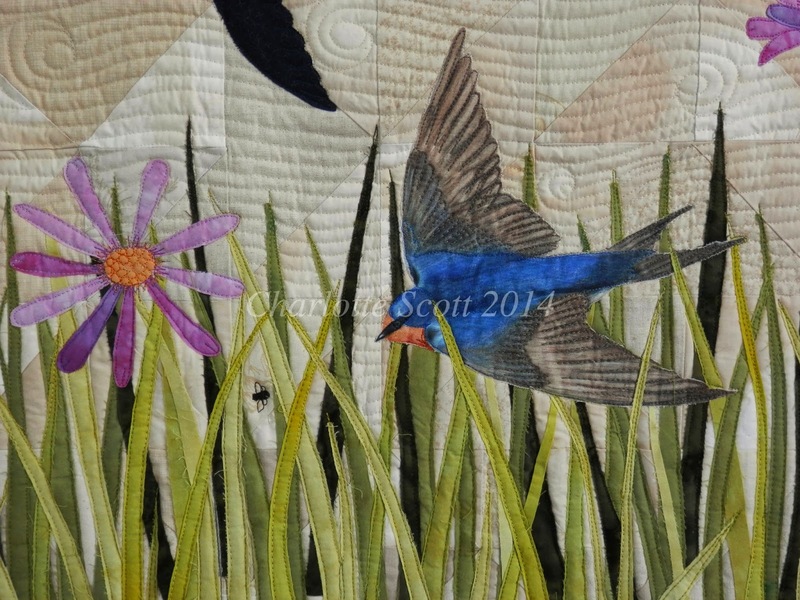 I love all forms of quilting but find that it is the artistic quilts that I want to make. 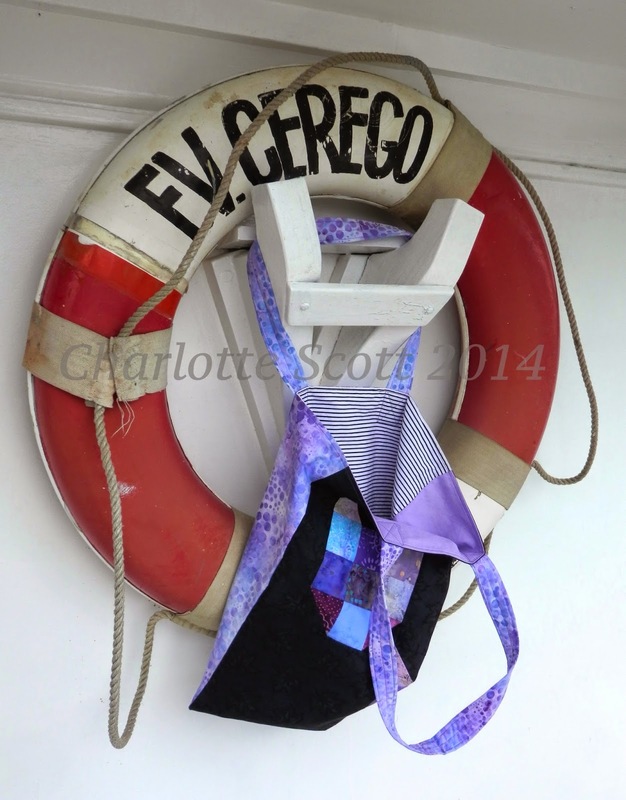 I find inspiration sometimes from the fabric I produce but more and more from personal feelings. Recently my work has reflected the impact the Christchurch/Canterbury earthquakes have had on me. I am part of Distressed Threads trio and really enjoy seeing the results of the fabric we make and also how people use our fabric. It’s a lot of fun. I am the current president of our National Association, Aotearoa Quilters, and encourage all quilters to become members and help us grow. 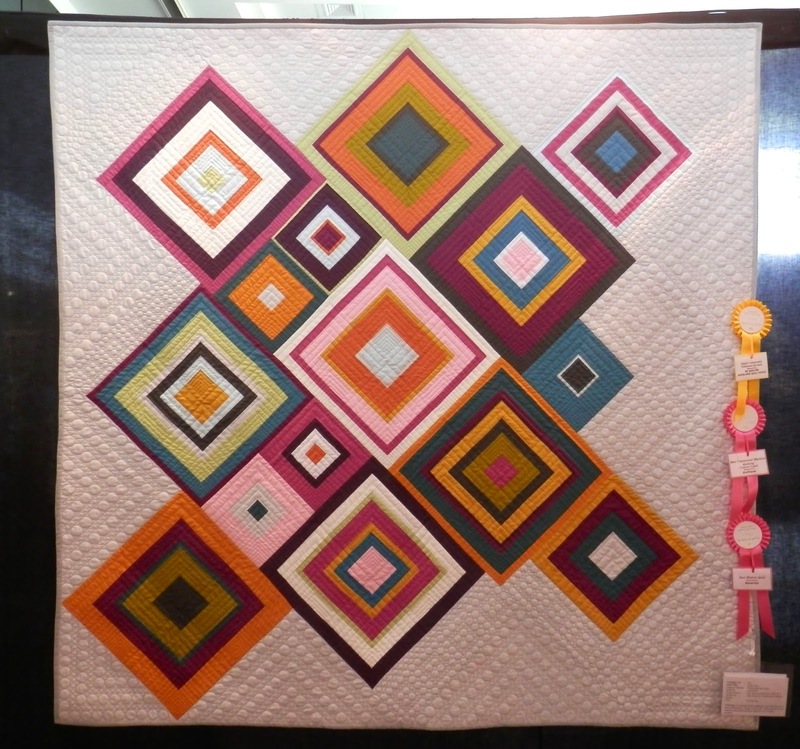 As a judge I am concerned with colour usage, design and the use of quilting (does the quilting pattern fit the design of the quilt) and technique. The piece has to work as a whole first and be interesting from afar as well as a close up inspection." Catherine generously sat and talked with me about all things quilty and now I get to share this talk with you. Thanks Catherine!